September | 2015 | StayDiapered! Disclaimer: Depression and Anti-Depression talk, mild language and adult themes from a little girl. Hi there friends~ This is little Riley, snuggled up in a blanket getting ready for bed. The GOP debate in the background, feeling a bit sick about it, probably going to turn in off here soon. Without getting too political, Donald Trump is an absolute clown, one of the worst entries into the WWE Hall of Fame. And Planned Parenthood has saved countless lives. So yeah, F this noise. I went to the Dr. today. I’ve been plagued with bad dreams lately, as well as some of the depression/anxiety issues I’ve laid out in the last few less than smiley posts. I hadn’t been to see my GP lately, but today was really, really good. It’s difficult for me to reveal my issues face-to-face with someone but today I did. We made a plan, I got a perscription, and I’m going to start down a path I never thought I would. I’ll be taking a mild Anti-Depressant, and goddamn is it hard to talk about this stuff. It’s just to get over a hump my Dr. said. I don’t want to lose myself but I also want to get better, I didn’t imagine i’d be this desperate for a solution to my pain, but I am here and this is now. I wore my protection to the appointment and got a ride from a well-wisher, comfortable and safe in a harsh and scary moment. While I type this, the TV is off and the Bright Eyes link I just posted playing in my headphones. 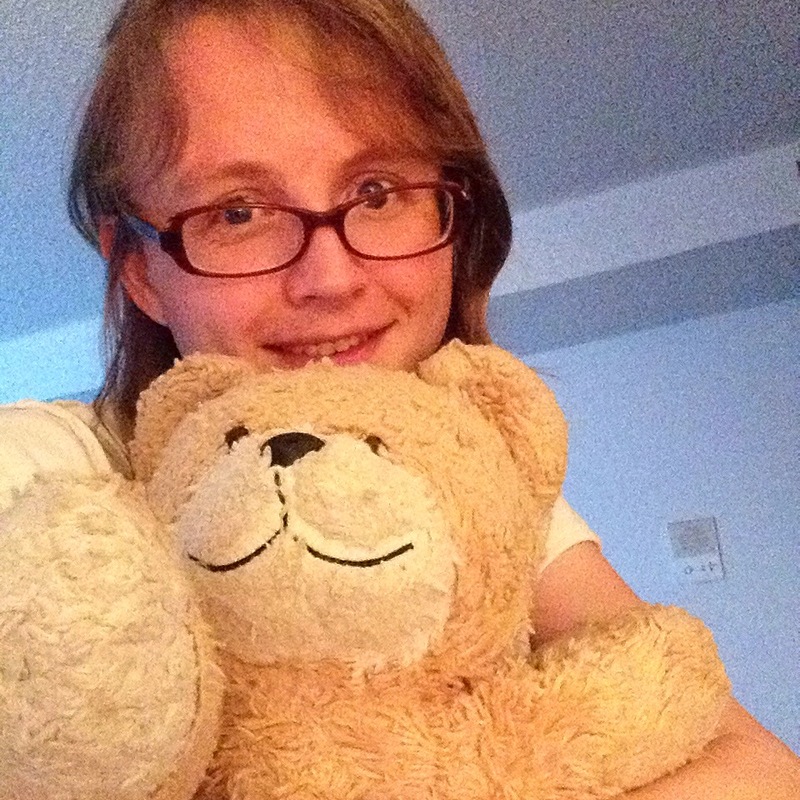 I’m going to curl up with my bear and think of kind words said to me, and other moments where I felt safe, warm, loved. Thanks for listening. Hi there friends! I have my sweater and my nappies on, my bear sitting in my lap as I type this. I have a couple pictures to share, but not anything from this very moment so you’ll have to use your imagination. Just close your eyes and imagine a smiley riley and a smiley bear. 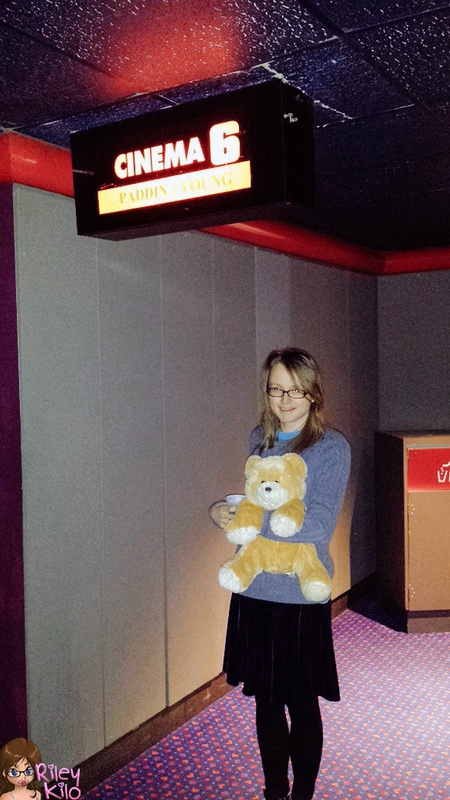 This was when I took Bear to go see Paddington. It was a very cute bear story and a good movie all around, for both bears and hoomans. I have another bear story for you though it’s not very cute, it’s a short one about Bears Discovering Fire, and you can read it here. There’s also a podcast that carries it, and I’d be happy to read it if anyone would be interested to hear. The podcast version starts about 5 minutes into the show, and I must say it’s a story with some sad, weepy elements. But definitely worth the read and I really appreciate the friend who turned me on to this (thanks D). I love when people share cool stuff with me… especially bear stuff! It’s beginning to get cold here just as I’m warming up to life. I forsee a fall and winter of sweaters, snow and snuggles. My last couple posts were pretty sad, and things have improved in my life since. Things aren’t 100%, still some struggles both new and old but I’m doing better at dealing with things. I’ve been back into my nappies, which improve my mood and wellness significantly. I’ve been working more and looking to get a second job here soon, all while making more solid plans for the future. You’ll be glad to hear i’m back on hormones, which is probably the best news for this growing little girl. I’m getting better at life, still barely holding things together but at least i’m holding things together. I edited a TON of pictures today, so expect some more pics and thoughts soon (within the week, not the year). Keeping with my bear theme in tow, here’s my favorite episode of that cute We Bare Bears cartoon. It’s fairly intense and more than a little relevant. The ending makes me hug my bears extra, extra tight. Hugs friends. Little baby bear hugs and big all-around-you bear hugs.